← How do you measure, measure a year? The last few weeks have caught up to me. I am completely knackered, to borrow a phrase from the Brits. I could sleep for days. And I definitely indulged far more than I should’ve last night. But it was worth it! Yesterday we had a small get-together at the house for my sister’s baby shower. She’s having a boy, so we decked the house in pale blue. I even painted my nails electric blue for the occasion! 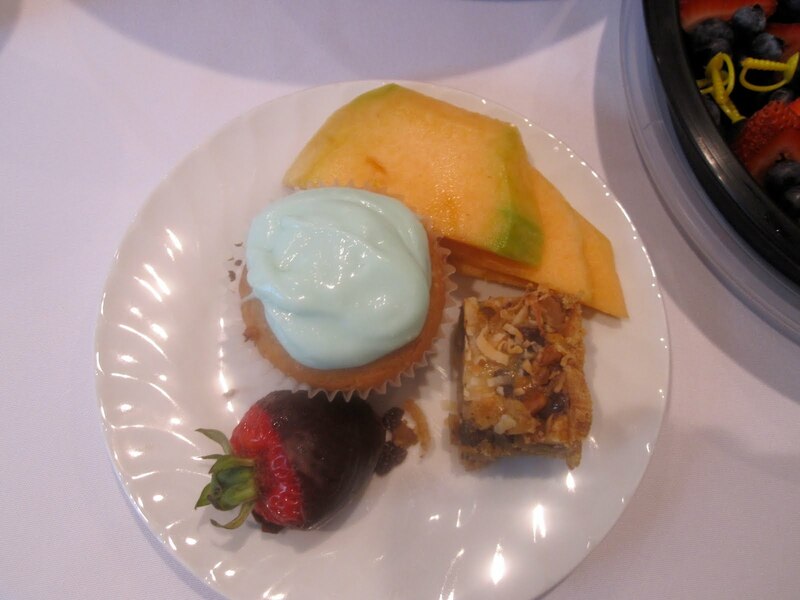 We had the party catered by a lovely restaurant called Chatterley’s in New Hartford. They always do an amazing job when we get their food, and they didn’t disappoint us this time. We ended up asking them for a light dinner of sandwiches and salads. 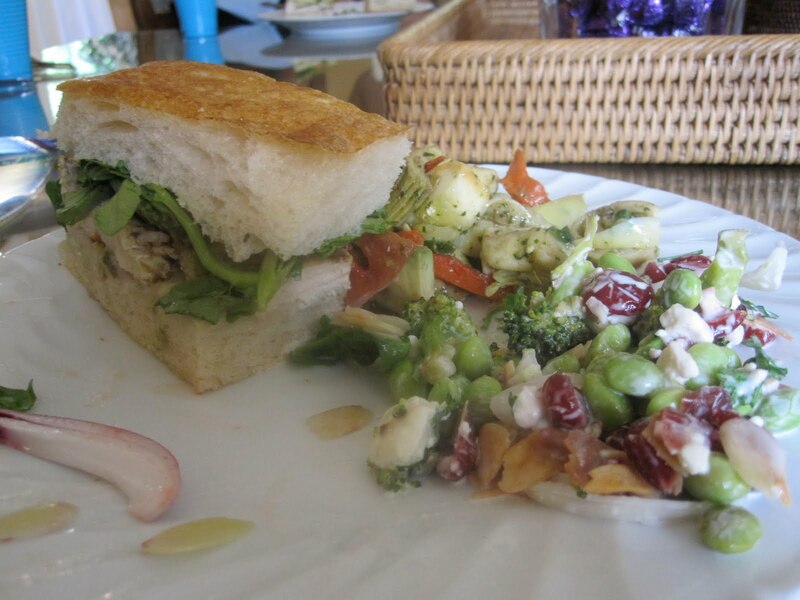 I enjoyed an amazing dinner of chicken/avocado sandwich, pasta salad, broccoli/edamame/cranberry/mayo salad, and strawberry spinach salad w/ sweet vinaigrette. My dish after I had demolished the salad. I ended up having seconds of everything. My ‘runger’ (runner’s hunger) was in full force. It would not be denied! One of my sister’s best friends is a gym teacher and she told me that my constant need to eat was a great thing, as it meant my metabolism was fast. Last night, I wished it was a little slower, because it was making me eat everything!!! I was still a little peckish after dinner, and once presents were opened we traipsed back into the kitchen for dessert. Chatterley’s had brought some finger desserts to nibble on, but I had decided to make a dessert as well. 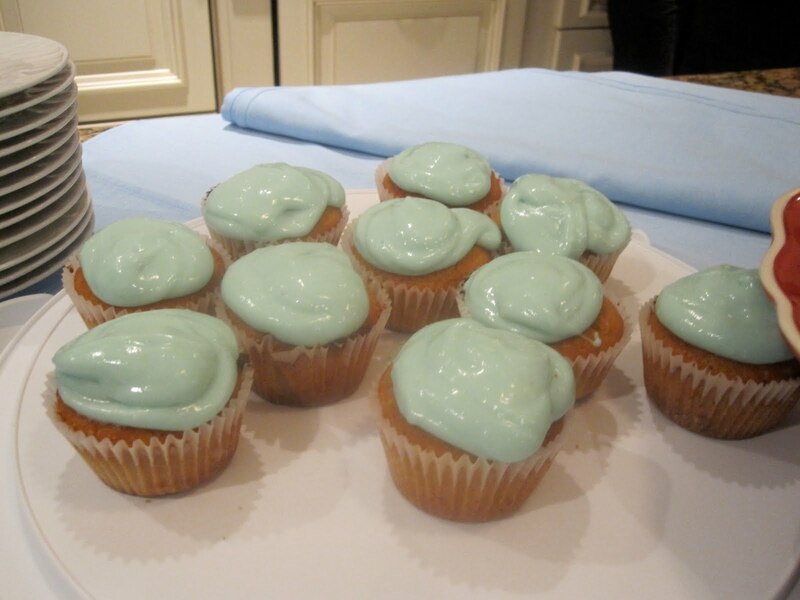 Basically these are just vanilla cupcakes (with Earth Balance, turbinado sugar, and almond milk) and a plain neufchatel cream cheese frosting that I jazzed up with food coloring. My one Achille’s heel was that I forgot to add vanilla extract to the cupcakes and icing (we don’t have any at the house!) so I was stuck with slightly bread-like cupcakes that weren’t very fragrant. They were still good, and about half of them were eaten! One of Jenna’s friends said the icing looked like the kind you want to scrape up with your finger. That thing on the left? I called it a Brie S’more. 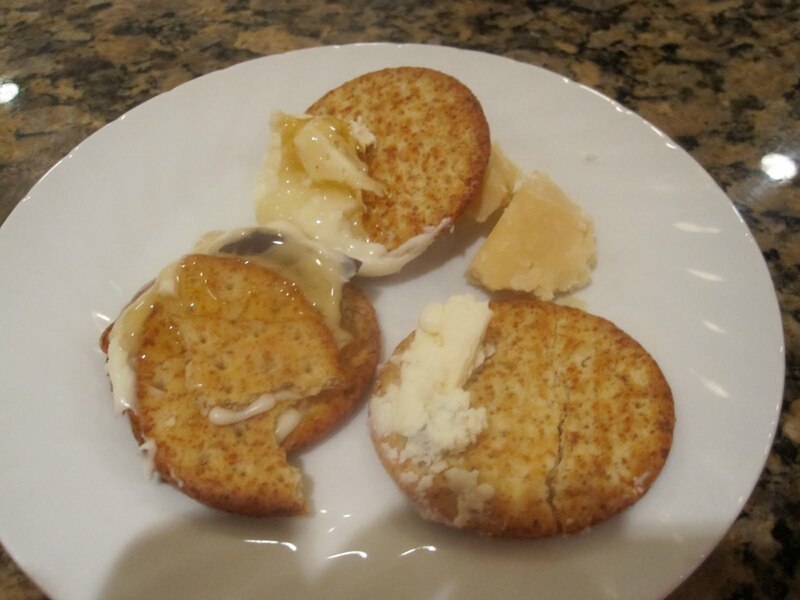 You take two crackers, smear them with Brie, put a little bit of honey and a piece of dark chocolate on top, and smoosh them together. Oh my GOODNESS. Needless to say, I went to bed a little full. Actually, I wasn’t stuffed at all. I was just full. Today, however? Oh, ew. This feeling is the worst. The day after a night of overeating is always critical. You want to feed yourself, of course. But your body is going to want certain things and you have to obey it. If you wake up so stuffed you can’t move the next day, obviously you’re going to want lighter fare. But you have to be proactive and not use one night of overdoing it to fall off the wagon completely. 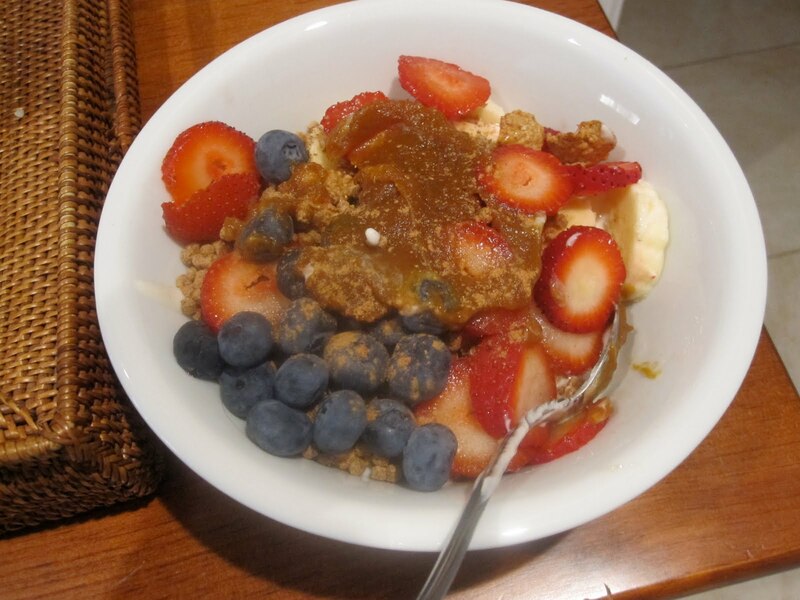 My bowl this morning contained one banana, Maple Wallaby Yogurt, 4 strawberries, handful of blueberries, 1/4 c Kashi Blueberry Harvest, 1/4 c Bran Buds, 1 tbsp Ground Flax, and a dash of pumpkin pie spice. That should definitely help. Now, off to get ready for work and pack my lunch!